Artichokes usually take more than 150 days to mature from seed and are highly sensitive to extremes of hot and cold-a narrow set of growing requirements that eliminates them from most gardens. What most gardeners don't realize is that with the right variety and the proper care, these large, perennial vegetables can actually be grown as annuals in many parts of the country. How much to plant: A single plant can produce as much as 5 to 6 heads in a growing season. 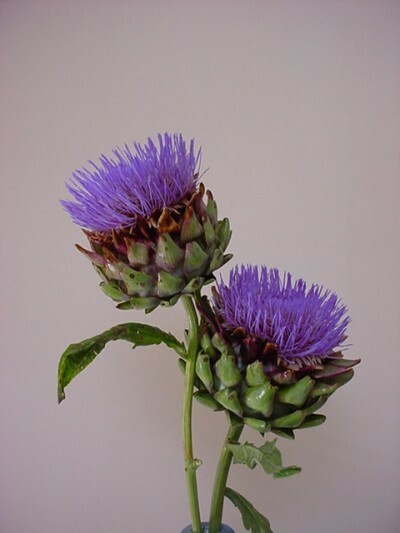 Three or four established plants should provide plenty of artichoke buds for a small family. Starting artichokes: There are a number of ways to start artichokes, from root divisions either purchased or separated from a desirable mother plant, or from seed. Root divisions are the preferred method because they offer gardeners a jump on the growing season. They are available in nurseries, garden centers, and by mail order in the early spring. Choosing a site: Choose a site in full sun with well-drained soil. If you're growing artichokes as perennials, position them to the side of the garden where they are less likely to be disturbed. Prepare the planting bed by digging equal volumes of compost and well-rotted manure into the top 12 inches of the soil. Plant each root division 18 inches deep, spaced 4 to 5 feet apart. Fill each hole with water and let it soak in, and then set the plant 6 to 8 inches deep in the soil. Water again to settle the soil and fill up the hole with dirt. Water new transplants every other day until you see new growth. Growing from seed: Artichoke plants take 100 to 150 days to produce "chokes" from seed. Start seeds indoors 8 to 12 weeks before your last expected frost. Soak the seeds for 2 days and then place them in a plastic bag with moist sphagnum moss, and refrigerate them for about 4 weeks. When roots emerge, pot up the clumps in individual pots filled with a sterilized potting soil and place them in a semi-cool room (60 F to 70 F) with lots of sunlight. Seedlings need cool temperatures to flower (produce chokes), so as soon as the danger of frost has passed, harden off the seedlings and transplant them into the garden. Artichokes grow into tall plants, so make sure you give seedlings enough space. These handsome vegetables also make striking container plants. Plant them in large pots with at least 2 cubic feet of soil capacity. Watering: Keep the soil consistently moist, but not wet. Artichokes can tolerate a little drought, but they won't flower as well in dry soil. Apply a 1 inch layer of mulch around the base of plants to suppress weeds and conserve moisture. Fertilizing: Artichokes are heavy feeders. Give them high nitrogen, water-soluble fertilizer like fish emulsion and kelp, every three to four weeks throughout the growing season-especially after a heavy rain. Fall care: In cold climates, treat artichokes as annuals. In milder climates, cut plants back to the ground in late fall and cover them with mulch. Plants growing in zones 8 through 10 shouldn't need any winter protection. Artichokes are seldom troubled by pests or diseases, but clumps do eventually lose their vigor and will need to be replaced every 4 to 5 years. The bud, or the immature flower, is the part of the artichoke that is harvested. The edible parts of the bud include the tender bases of the leaves (bracts) and the fleshy base (the heart). When the artichokes are ready for harvesting the flower buds will still be green, and the bracts will be tight against the bud. To harvest, cut them with 2 to 3 feet of stem still attached. After harvesting each stalk (the central stalk will flower first), cut them back to about 1 foot above the soil to encourage new shoots to form. Expect each plant to bear several buds during their first season. From the second year on, plants grown as perennials will usually show an increase in production. Insects and other small insects can sometimes lodge themselves in the leaf bracts of artichokes. To clean them out, immerse the artichokes in a warm, saltwater bath for 10 minutes right after picking. 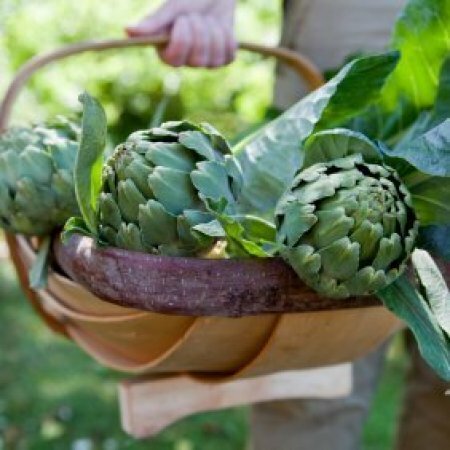 To keep artichokes fresh, arrange them like flowers in a large vase with the heads up and the stalk submerged in water. The hybrid 'Imperial Star' is a popular artichoke variety that matures 85 to 100 days after transplanting-about 80 days faster than the old classic, 'Green Globe'. Another hybrid, called 'Violetta', was developed for hardiness and has a lovely violet color. Gardeners in the southwest may want to consider the 'Texas Hill' variety, which is known for its ability to perform in high heat with mild winters. Plant artichokes in full sun and provide light shade where daytime temperatures exceed 80 F.
Provide a long growing season with warm days and cool nights. Replace plants every 4 to 5 years; in cold climates, grow them as annuals. Thank-you! I am going to try globe artichokes in our garden and am collecting all the information I can on growing the things. Should be interesting because I live in Scotland in an area that works out to about 7A zone wise, but I am still going to give this a try. Glad to hear that someone else wants to try to grow these. I grew up in California next door to a farm of chokes. Now I live in Wisconsin and want to try to grow them myself as they are very expensive here. Would like to hear how you do and will be happy to post how I do. Don't forget to leave at least one artichoke grow its flower to its full size. One you will not eat but it's worth the effort as artichoke flowers are so beautiful!